As a cancer survivor, I worry about recurrence and about illness in general. I don’t know what life has in store for me, but I do know that I want to give myself the best possible chance to live it as fully as possible. While everything I’ve read and heard indicates that positive thoughts are a key to staying healthy, it’s not always easy to keep an agreeable and favorable outlook. However, through my work at a breast cancer wellness center, I was introduced to the concept of a gratitude practice, a simple process that helped me transform into a calmer, more positive me. A gratitude practice consists of calling to mind three to five things you’re grateful for each day. 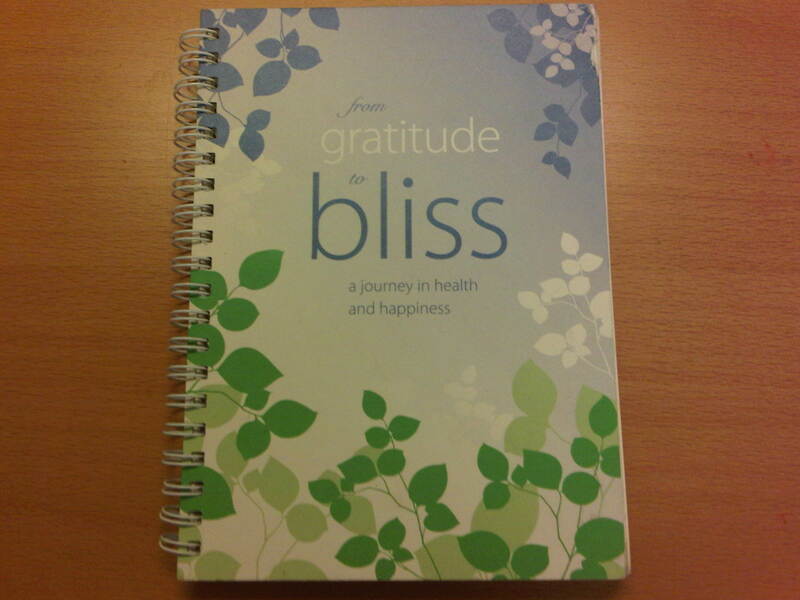 If you’re like me and prefer to write things down, you should check out a book called From Gratitude to Bliss: A Journey in Health and Happiness, by Lorraine Miller. It’s essentially a guided journey, with sections set aside for you to transcribe your own thoughts. In your journal, or even just mentally, you begin by stating your intentions for this practice, what you’re hoping it can bring into your life. It may seem like a lot of work, but it boils down to just staying focused on your practice once a day, every morning or every evening, or whenever is convenient for you. Keep it simple and don’t worry if you can’t list five things right off the bat. You can include very simple thoughts, such as: I am grateful for a warm bed, or I’m grateful for sunshine in the morning or I’m grateful for my dog licking my face. I started my practice on a plane ride starting a recent vacation, and I jotted in my journal that I was grateful to be sitting next to my husband of 22 years — I knew there was no place else I’d rather be. And then I reflected back on that simple statement and realized the power it contained. Gradually, I started to have a different perspective on the little things I often obsess about. Some of the things I’m grateful for reappear every day, and that’s fine by me. I always include an acknowledgment about my husband and also about my son, of whom I am forever in awe. Others things tend to vary on my list, but one consistent element I’ve noticed throughout my practice is how much better I feel each morning and how this simple procedure puts me in a better frame of mind to handle whatever comes along throughout the day. 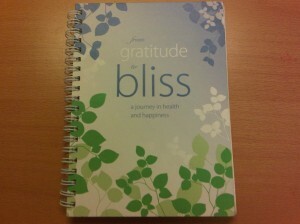 One of the biggest benefits of a gratitude practice is the increased ability to handle stress. Recognizing everything I have to be grateful for certainly helps when things are not going my way. It gives me an opportunity to view the glass as half full, rather than half empty, to see the good things I have in my life and let them stand tall against any creeping pessimism and self-doubt. Another benefit can be found in the area of improved personal relationships. Appreciating others results in being appreciated by others. We can also experience a better relationship with food. Appreciation for all we have in our lives leads to a better appreciation for our health and, consequently, better food choices. The serenity that comes with a healthy gratitude practice can lead to so many positive benefits in all aspects of our lives. So take out your journal and a pen, sit quietly and jot down three to five things for which you’re grateful. It will be a departure point for your journey toward bliss. Lisa Wolfson lives in Rockville Centre, New York, and volunteers at You Can Thrive!, an organization that provides free and low-cost support services for breast cancer survivors. This entry was posted on Thursday, November 10th, 2011 at 5:39 am	and is filed under Cancer, Emotional Support, Gifts and Gadgets, Stress Reduction, Uncategorized. You can follow any responses to this entry through the RSS 2.0 feed. You can leave a response, or trackback from your own site. Keep a current list of contact information, like doctors, neighbors, etc.